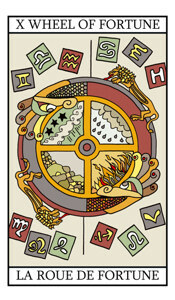 The Wheel of Fortune is a card of fantastic, great positive change and all for the better. In many respects this card is one that suggests that you have got a good chance that you will get the finances you require or the job you wanted or you will succeed at what you set out to do. Obviously nothing Is ever guaranteed, but with the Wheel of Fortune in your spread you certainly have a positive omen on your side. This is a card of good luck, fortune and change and this is change for the better. However in order to fully succeed you must also be prepared to adapt to this change and be open to it and work with it. This is a card of good luck. Wheel of Fortune Card illustration.